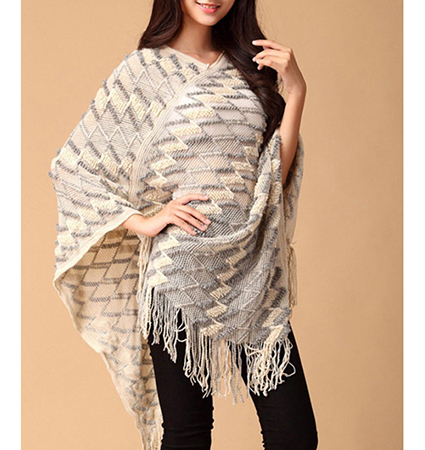 This Womens poncho has a transformative affect that can change any outfit into an attractive, up-to-the-minute fashion statement. It is presented in a lovely shade of off white.. The garment is a loose, free-flowing wrap made of a loosely woven fabric. It has a round neckline and is long, with the hem ending at approximately knee length at its longest point. A row of long fringe lines the hem. It is completely open on the sides, and has a diagonally-sewn seam across the front. This garment has no zippers or buttons, but fits easily over the head. It is roomy and comfortable, as well as warm. It is available for purchase in size Medium only.